Last week, one of our rookies went up against a Redwood tree and got smoked by veteran climber and boss, Zac, during his Deadliest Job Interview. Here is a peek at this Episode 3, Smoked. Meanwhile, hoping for a job as a commercial diver, Erik welds a patch on a sunken submarine. Rookie heavy haul driver, Fred, battles through Hurricane Patricia. Three lessons into his bush pilot training, Ron ends up in a hospital. Stay tuned for more episodes of these hazardous professions including the tree men from Sonoma-Marin Arborists, Inc., South African bush pilots, heavy haul truckers, iron erectors, underwater construction divers, volcanologists exploring active Italian volcano Mt. Stromboli, and wind turbine technicians as rookies—a.k.a. “greenhorns”— learn the job as a grunt, and learn life-or-death on-the-job training. 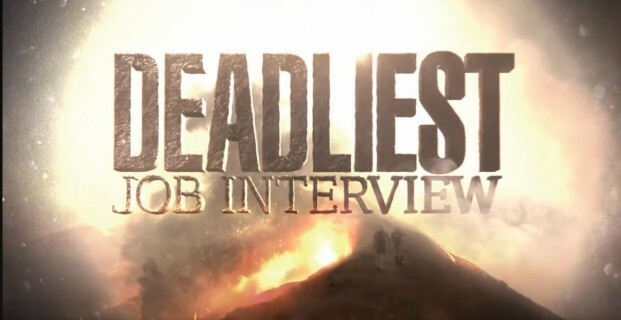 ‪#‎DeadliestJobsInterview Fridays on ‪#‎Discovery‬ at 10PM ET.